On this page, you’ll find some basic information about DMR, and some handy information for those in and around Essex. DMR is a Digital Voice mode. There are three Digital Voice modes currently: DMR (Motorola), D-Star (Icom) and Fusion (Yaesu). 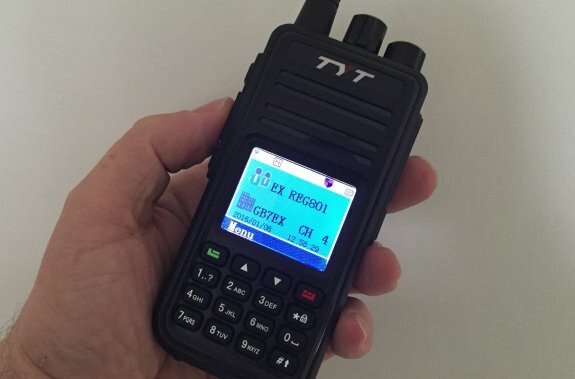 DMR is gaining ground, and price may play a part in this.Handsets, such as the Tytera MD-380 are now around £100 (much cheaper than a D-Star). DMR repeaters are configured to allow access to selected “Talk Groups”. As a repeater can only have two slots, only two of these can be used at any one time. TG235 UK-Wide UK-wide Calling. Opens all repeaters. TG13 Worldwide English World-wide Calling for English-speakers. Use for a short time to establish contact, to avoid tying up the group. seems to be now closed. Is GB7KH going to be added to this list? Does anyone have any DMR (*cough* burn-the- witch!) experience on this repeater which seems relatively new. We’ve added GB7KH to the list – thanks for the nudge. Does you network allow usage of the DMR tier 2 SL4000 radios? I am after the same, but for the time being I am trying to write one but having difficulty with simplex digital. Its worth reading the q&a sheet on Radioddity site. I found it has a password to access some greyed out boxes. My laptop’s on Win 7 & 10 needed older cps software to “see” radio, the recent updates didn’t work. At the moment I am having to do it all longhand & remembering to Save….. However it is a nice radio & works well on FM on a local repeater. Waiting for return of my DV4Mini hotspot to check out DMR, so still codeplugging my laptop.